The main focus of Frozen Skies is unsurprisingly aviators and their aircraft, plus a fair amount of time spent in the wild blue yonder. There are going to be times when the characters will find themselves with their feet firmly rooted on the ground over the course of their adventures, a good part of that will probably be at various different aerodromes. These aerodromes can range from the 'air stations' of the Commonwealth Air Force through to airstrips serving remote settlements in the Alyeskan wilderness, but the PCs can expect to visit each type at one time or another. These are the air bases of the Commonwealth Air Force and typically come with significant facilities to support aircraft and crew. 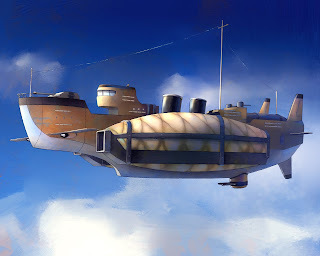 Though primarily used by the military they do see some use by the Alyeskan Aerial Corps, typically moving supplies and men to wherever is required. Comforts on offer tend to vary with the size of the base. ACLGs are small airfield scattered throughout the Alyeskan wilderness, though they're little more than a runway with fuelling equipment and a single hanger for light repairs. These airfields also feature a large wooden hut that serves as both accommodation for the airfield's staff and as a terminal building for passengers and freight. There are the numerous airstrips found across Alyeska in remote areas, serving either mining camps or isolated settlements. Often they'll have little more than fuelling equipment available, though some run by keen businessmen will have greater facilities on offer even including bars and motels. Another setting idea and thus entry on the 'Would Like To Do Someday' list. This one is fairly similar to the concept of the Weird Wars: Home Front idea, arguably it can be said it is aside from some minor details. The main difference would be the backdrop of 1918 London at the end of the First World War and the Spanish Flu epidemic. Elevator Pitch: Supernatural horror amidst a plague ravaged 1918 London. Genre: Weird Wars, Horror, Supernatural, WW1. Inspiration: Vampyr, Dishonored, Ripper Street, Baltimore: Plague Ships, Weird War I. Much like Home Front, this is a sort of civvie street counterpart to Weird War I but focused on London. 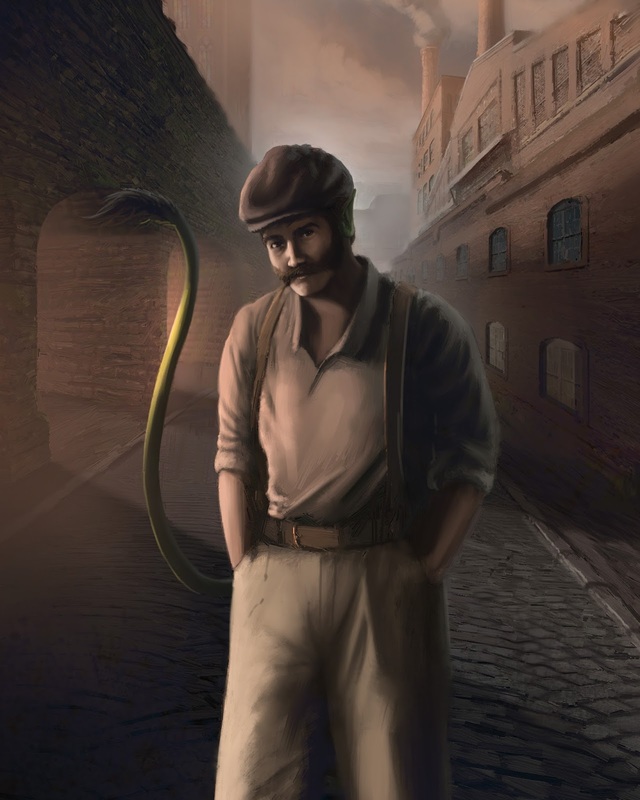 The city's poorer districts are being ravaged by the Spanish Flu, though something much sinister lurks in the gaslamp lit back streets and alleyways. Dark things followed the soldiers home and now haunt the fabled London fogs. The Weirdness of the Weird War is drawn to the death and fear in London like moths to a flame thanks to the Spanish Flu, though some of it hails from the war years but some stuff dates back to much much earlier. Thanks to the flu creatures like zombies, 'Gloms and ghouls can be encountered in the rougher parts of the metropolis especially in areas where mass graves were dug. Course there would be other beings taking advantage of all the death and suffering. MI-13, despite in the midst of being wound down after the war, would be tasked with keeping the weirdness under wraps and contained. The Metropolitan and City of London police forces would be increasingly used by MI-13 due to reduction of resources, possibly bringing it into conflict with the Home Office. Either way possible ways of bringing the players in. This week is something a little different and quite possibly the start of another anti-series of posts much like the Gazetteer and Rogue's Gallery posts. 'Alyeskan Tales', as this new series is going to be called, is intended to cover the various adventure ideas I have for the Frozen Skies setting. These adventures will be a bit rough and ready, though they probably will be polished up at a later date especially if I get feedback. "A beacon station that guides aircraft across the Dragonspine Mountains, on the air route between New Gwentia and Calharrow, as requested emergency supplies before it is cut-off by a blizzard. Bureaucratic wrangling has meant that a very short and rapidly closing window is now left before the storm hits, meaning anyone who delivers the supplies could quite possibly find themselves stranded." The players are presumed to have access to a cargo plane (the equiv of a C-47 Skytrain/Dakota) and have been chartered by the Alyeskan Aerial Corps to deliver the supplies. Bureaucratic red tape has meant the flight be delayed so that the players will have just barely enough time to complete the delivery before the blizzard hits, the leading edge of the storm will make flying a little difficult and so a -2 penalty on Piloting rolls will be in play as the players approach the station. The destination of the players will be Beacon Station K-22, an outpost in the Dragonspine Mountains that maintains a radio navigation beacon to guide aircraft through the mountains. K-22 is staffed by four airmen, an NCO and an officer who's job it is to keep the beacon working. Layout wise it consists of a large radio tower that stands next to to a large, long wooden hut that serves as a combined radio building and barracks. In addition there is a smaller wooden hut that serves at the stores, a lean-to W.C. shack next to the barrack hut and a small hanger that contains a workshop that can do light repairs to aircraft. The clock is very much against the players as they attempt to beat the storm, especially after various hold-ups led to a late departure. By the time they've unloaded their aircraft at K-22 the blizzard is pretty upon them, effectively grounding them until the storm passes. So the players will have to sit it out in the barrack hut with the outpost's unit with little to do other than trying to pass the time. A short time after the blizzard hits one of the airmen heads outside, either to relieve himself in the W.C. or to fetch something from the stores hut. Allow another short period of time to pass until the airman is considered to be overdue, at which point the NCO and another one of the airmen will head outside to search for their missing comrade. Make the players do a Notice roll but with a -4 penalty due to the blizzard outside, if they succeed will hear screams and gunfire from the two men. The second airman will hurry back inside, reporting that they had been attacked by something which killed the NCO and presumably the missing airman. The first of three waves of attack will begin with Wulver Stalkers (see stats below), there will be four Stalkers plus one for each player character. The Stalkers will use the blizzard for cover as much as possible, so treat it as being Dark. Plus the Stalkers will attempt to break into the barrack hut, though unless they're all killed they will withdraw after five rounds of combat. An hour or so later the second wave will hit, this time consisting of 2-3 normal Wulvers per player character plus any Stalker that survived from the first wave. Like the second wave will they attempt to break into the hut, though this time they will withdraw after ten rounds or after they've lost two-thirds of their numbers depending which comes first. Final wave of attack will come roughly half an hour after the second wave, this time consisting of 3-4 Wulvers per player character plus an Alpha and any surviving Stalkers. After ten rounds roll a d6 and a roll of 'six' the cavalry will arrive in the form of a gyro-carrier and a squad of Wulfbane Commandos which should tip the odds in the players' favour. By this time the blizzard should be passing and the players will finally be able to leave Outpost K-22. The airmen consist of Aircrafthand Banks, Aircrafthand Collier, Aircrafthand Stevens and Leading Aircrafthand Bartlett. The NCO is Corporal Higgins. A/O Reynolds the commanding officer of Outpost K-22. In Alyeska there but a handful of individuals who wield great influence yet lie a step away from the public limelight, preferring to work partially behind the scenes. Madame Orla is one such person, well known as both the owner of a certain infamous 'house' and information broker. There is more to the Madame than meets the eye. Much of Madame Orla is surrounded by mystery. Her skin tone, accent, and mannerisms bespeak of her hailing from some locale far beyond Alyeska's shores. Her advanced years have done little but refine her exotic and alluring beauty, which attracts men to her 'establishment' like moths to the flame. Whilst most come for the fine drinks and scantily clad girls, there is something else that draws aviators. Madame Orla has built up a network of contacts amongst Alyeska's shadier denizens and is the main person to speak to when looking for work thats not strictly legal (though minus her cut of course). Madame Orla is well aware of her establishment's reputation and bars undesirables such as drunks, tramps, and even the law from entering. She makes good use of enforcers to ensure her rules are obeyed and to ensure prompt payments from her clients. What isn't generally known is that her family hails from a distant province of the former Holy Sodkan Empire, though they departed there long before the Great Darmonican War and have had very little contact with their homeland ever since. Her father worked for the Empire's intelligence service, but left after an apparent 'disagreement' with his superiors and moved his family to Alyeska. Orla's father continued to ply his trade as an intelligence operative, though this time as a freelancer selling secrets to whoever had the money. Most of his clients ended up being sky pirates seeking shipping lists for potential targets, the young Orla became fancied by them and despite her father's best efforts joined one of their bands after she fell for their leader. Things to begin with did not go well for her, most of the other members of the gang looked down upon her as an overeager wet-behind-the-ears rookie. Worse still the gang leader saw her as just another woman to bed, something that he didn't have long to regret when Orla eventually killed him and took control of the gang. In time her band become one of the most feared gang of sky pirates and probably the most highly skilled, but Orla was careful to never be publicly seen as the gang's leader which paid off when she choose to semi-retire. These days she runs a number of brothels that she'd setup using the fortune she had gathered as a sky pirate, these also double up as safehouses for her sky pirate gang which she retains command over. Though her sky pirating days are over she still profits from her gang's activities as well as selling the information that her girls collect, though the choice targets always go to her gang. Her girls also collect the dirt on other sky pirates, particularly rivals and those that mis-use one of Orla's houses. With only half the group in attendance for this week's Game Night ended up doing a quick and dirty playtest of the Air Combat Rules for Frozen Skies. A couple of things sprang up as we did a quick dogfight and prompted some thoughts for a couple of additions to the rules, also waiting to see whether the players had any thoughts as well. Regardless this week sharing the Setting Rules as they currently stand along with the proposed additions. A bit more polished up much closer to what will hopefully be their final form for release, feel free to have a butchers and let me know what you think. *When using miniatures with the Frozen Skies Air Combat Rules divide the weapon ranges and aircraft speeds by 10, you're much less likely to run out of table space this way. *Under Aircraft Modifications looking at adding Improved Gunsights, effectively a +1 bonus on Shooting rolls with the aircraft. Little bit of a short post this week. Not much to report compared to last time, things are now plodding along. Work on Frozen Skies has been progressing on both the artwork and writing front, not as quickly as I'd like but its still a step in the right direction. Once I've cleared some stuff from my plate I should have a bit more spare time that I can dedicate to the writing. Though sales of the Setting Primer and the adventure have been ticking over each month, it nice getting a Sales Notification to help show there is growing interest. Got responses from the podcasts that I've contacted, though nothing worked out as of yet and I need to poke them soon. Finally new artwork; A Genchi, a race related to the Windryders but industrial/technology inclined. Believed to have once been slaves of the Ancient Terrans, but are basically second class citizens in modern Darmonica.